If the pen is mightier than the sword, then the keyboard is like the Death Star’s Gamma Ray burst onto Alderaan, a universal weapon of choice adopted by individuals I would like to call, Keyboard Warriors. Call them warriors, avengers or perhaps even bounty hunters. Yet, the unfortunate fact is that many of these individuals often end up turning to the dark side, transforming into a Sith Lord rather than the Jedi Knight that they were trying to be. In the case of Amy Cheong, tons of individuals rightfully stood up against her racist remarks, but many comments through multiple forums ended up becoming just as bad, if not worse then what Amy had updated. With online regulations still being a grey area, perhaps it would be wise to help draft out a law that does not constitute a criminal charge, but will no doubt influence the way these Keyboard Warriors think. 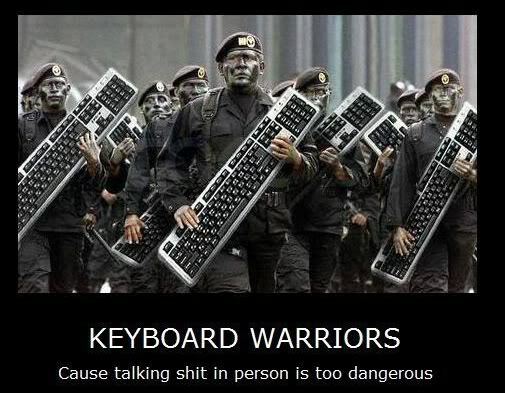 We will call the law, the Keyboard Warrior Enabling Act. 3.) Carry a network / Wi-Fi jammer to ensure that when you are with your friends, no one is allowed to login online. Must proceed to talk to them in person thereafter. 5.) Attend three face-to-face talks with members from various communities that may include political parties, grassroots groups and community welfare societies. 6.) Carry out all previously online enabled transactions such as movie tickets, bill payment and airline ticket booking through phone or manual booking. 9.) Must visit any heritage institute or museum at least once and write in his/her diary about the experience and what other people can learn from there. 10.) Only allowed to use film cameras to take photos but is allowed to use a scanner so that he/she can put the photo up on his/her own physical wall. Perhaps through this law we can make the online space just a little better don’t you think?